My Development Setup. What’s yours? It’s a Sunday evening and I am sipping an ice cold G&T now that my DIY bits are done for the weekend. Am i the only one who gets major lag running VS2013 on win8 on a mac using parallels 10? #Inception #dreamiscollapsing #timeforbootcamp? I replied to Pete saying I have never had any issues and that I would write about my experiences, hence this post. Pete and other people have asked me before about my setup of my machine I use for coding and I want to discuss about my particular setup and start a wider discussion with the community about their setups. First of all you may be wondering why you would want to toggle the display of the tree navigation, considering that this is the main & primary navigation when using the Umbraco backoffice, however on a project I am doing at work a new property editor that is being developed requires more screen real estate and toggling the tree navigation allows the content editor to see & use this property editor a lot easier, as it involves plotting objects on a canvas. So as much space as possible is useful in this case. I would be interested to hear what other people think of this and should this tree toggle become part of the core by doing a Pull Request and if was to become part of the main UI, where should the button go or by double clicking the grey area with the application/section icons toggle this action? Well let me know by leaving your thoughts in the comments. I have written a blog post for a little while. So I thought I would create a package for Umbraco Contour. If you do not know what Umbraco Contour is, surely you have been living under a rock?! Hello all this is another ‘What on Earth‘ blog post detailing a specific feature or functionality of Umbraco that may be hidden away a little & this blog post is here to help describe & detail it. So I have been lucky enough to come back from a fun packed, long week with my second family the Umbraco community at the annual Umbraco conference, CodeGarden. I wanted to say a BIG thank you to everyone who voted for me this year to receive a community award, the Umbraco MVP award. I may not has been active as other members of the MVPs on our.umbraco.org however I like to think this blog with various code snippets & findings I have found out along the way has been useful to yourself & the community, in addition to running the weekly(ish) Umbraco Show & Tell Google Hangout, called uHangout. What is an Umbraco MVP? MVPs are quite common in different projects and they’re all inspired by Microsofts “Most Valued Professional” program. In Umbraco MVP stands for “Most Valued People” as we see at least as big value in amateurs as in professionals. In fact several Umbraco MVPs started as amateurs only to find that Umbraco is now the cornerstone of their professional career. An MVP is a person who’s not a part of the core team nor a part of the Umbraco HQ (the company), but in some other way adds extraordinary value to the project. Looking back at previous MVPs this translate into being friendly in the forum or making incredible and highly useful packages. In other words, MVPs represent the best of the community which is the last building block in what makes the foundation of the Umbraco project; the company, the core team and the community. I want to end my post with a big thanks & a H5YR (High Five You Rock) to the other Umbraco MVPs who help make the Umbraco community fantastic with the packages they create, to the very detailed & helpful answers they post on our.umbraco.org. I swear Jan never sleeps as he always finds the time to post on the forums. So a big thanks to my fellow MVPs & nominees you all do outstanding work & help make this a better place for all. I never thought in a million years I would be awarded MVP, but it’s easy to get involved with the Umbraco community and you never know it could be you next year. No I am not trying to be a kid from the 90’s and start every greeting off with yo, but in fact I want to introduce you to a new tool I have built called Yo Umbraco, which help boost productivity for developing property editors for Umbraco 7 & newer. Note: This is a cross post from my blog post over at Work’s blog at CogWorks, this is a cross post to keep a record of my findings. 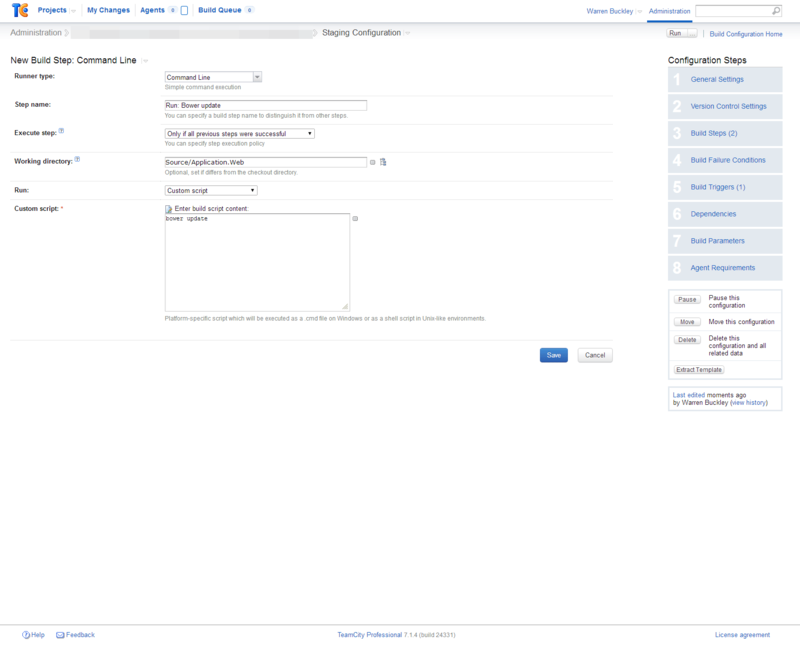 What is TeamCity and Continuous Integration? 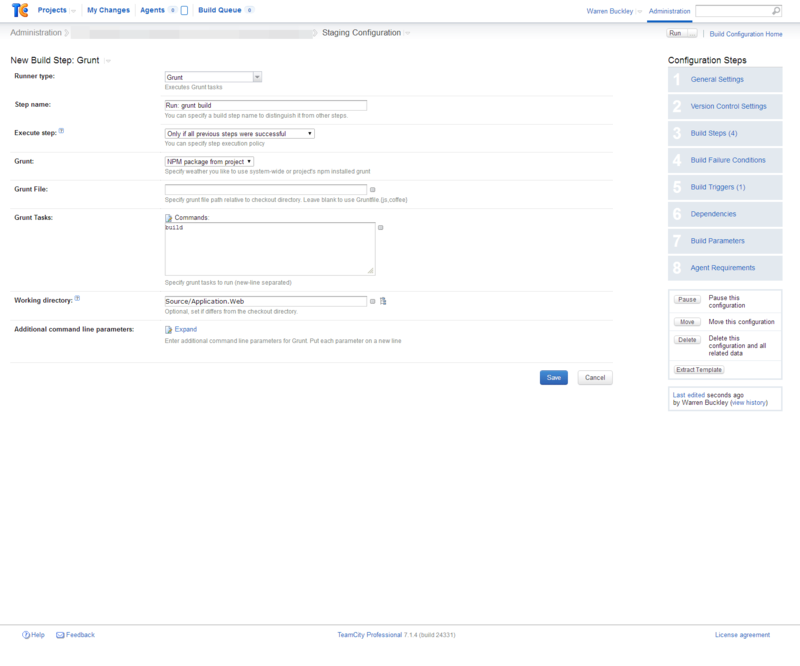 TeamCity is a tool developed by JetBrains to run a continuous integration environment. This allows the development team to push to a Git repository and for the TeamCity tool to monitor the Git repository and perform a series of build steps in order for the website to be built and deployed to a webserver. In our case at The Cogworks, a website in our development environment. This allows the code to be checked ensuring the code compiles and builds, as it would inside Visual Studio. You can then be sure that a working site is deployed. With TeamCity you can be as simple or fancy as you like, involving build steps that copy files from one place to another or running complex tasks such as utilising tools to help you migrate databases from one environment to another. There are plenty of scenarios and ideas that can be setup to fit your team’s development workflow. What are NodeJS, Compass, Grunt and Bower? Before I go onto explain this, I’d just like to add a disclaimer that I claim to be no expert in this field and someone with more experience with these tools may give a better explanation of their use. So as I am still new to these frontend tool sets I’ll try my best to explain them. Next onto Compass, this is seen as a common and useful extension to the popular CSS preprocessor Sass. It also gives some extra functionality to your Sass files for example providing the power to automatically create a sprite image and use it in your CSS – It’s voodoo magic!! Finally, Bower is a front end package manager which is built by the guys over at Twitter and runs on NodeJS. This fetches other front end tools you may wish to use. For example you may use Bower to install and fetch the latest version of jquery, jquery-ui and jquery.cookies along with a range of other client side dependencies. This is similar to the NodeJS NPM repository, but instead is aimed at web dependencies from jQuery to handlebars. Why do we need all these frameworks? All these tools basically allow us to write better front end code. It allows us to compress images, minify large JS and CSS files and hel pus improve the overall quality of the browsing experience on as many devices and connection speeds as possible automatically. 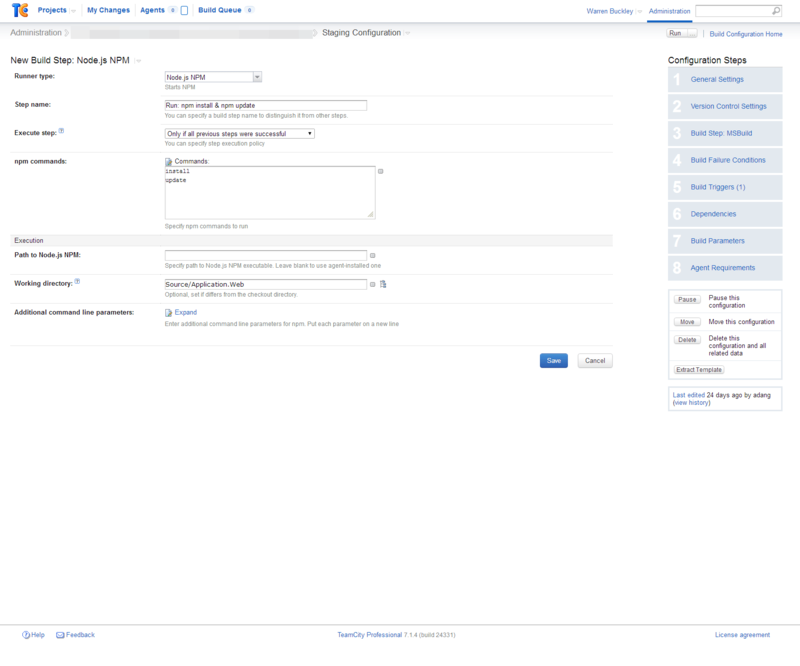 They help us take some of the hard work out of this by allowing us to automate a lot of the front end build processes. You can think of Grunt as the front end developer equivalent of a build process like we do as .NET Developers. 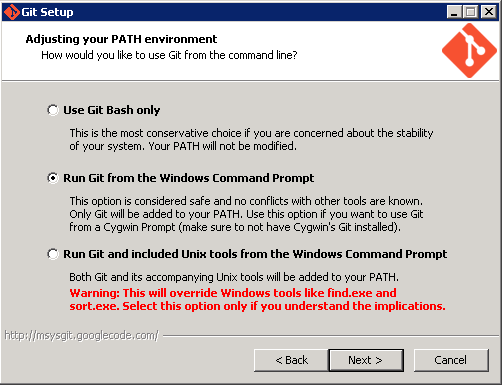 From the screenshot above, you must ensure you chose the option to run Git from the Windows command prompt. 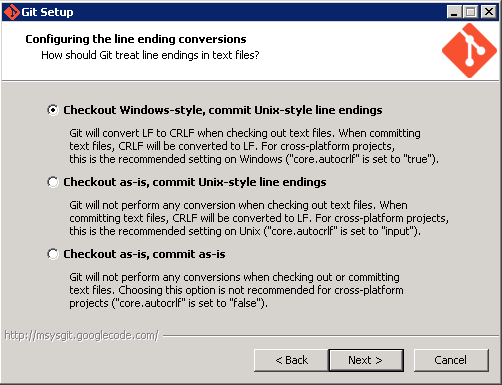 This ensures that you can type Git in any console window as it has been added to your computers PATH. Without doing this you will make your life hard if you work with things like bower.io where it expects Git to be in the PATH. Now that we have Git installed, let’s quickly check and ensure it is actually installed correctly. From a console window type the following git -v and hit enter. You should see a version number displayed if git has been successfully installed. The next part that I needed to install on the server was NodeJS which allows a whole heap of extensions to be installed via NPM (Node Package Manager). Think of this as the equivalent of NuGet in the .NET world but just specifically for NodeJS. Again as with the Git install, there is an important step to ensure the following commands node and npm are available in your console window globally by ensuring NodeJS and NPM are installed in your PATH. 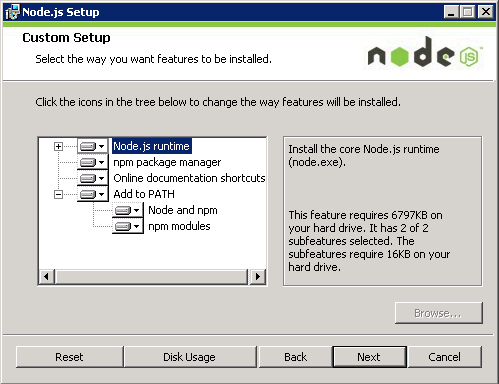 Once the NodeJS installer has finished lets test and ensure that NodeJS has been installed and available globally in our Windows console. Type node -v into the console and hit ‘Enter’. You should see the version number displayed if it has been successfully installed into your PATH, next try npm -v and see if that also returns a version number too. Bower is a front end package manager from the Twitter team and uses Git to consume the packages. To install Bower we need to install it from the node package manager (npm). In the console window type the following command npm install -g bower this tells npm to install the Bower package globally. This allows us to use the command ‘Bower’ in our console window from any location. Similar to how Git and NodeJS was added to our PATH. This is where you will see your console window go nuts as the NPM goes and downloads Bower and it’s dependencies. Do not panic you will soon get used to the number of dependencies any NPM package has. Again to test that Bower has been installed successfully use the bower -v command. Bower is not a requirement but as our front-enders were using Bower in their workflow we needed to install it too on our build server as well. The next thing we need to install and setup for our workflow is to install GruntJS which is the task runner or the equivalent as the front-enders build steps. To install this we need to install Grunt from NPM with this following command npm install -g grunt-cli which tells node to install the Grunt command line runner globally and make it accessible from any console window. 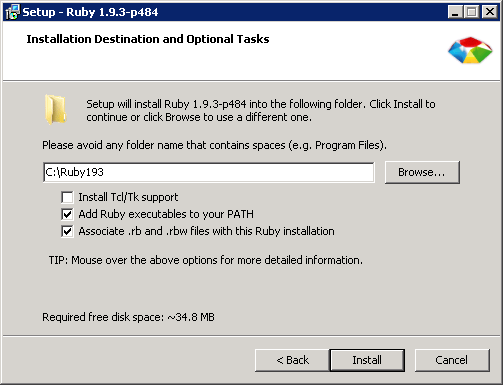 The next part we need to install is Ruby, this allows us to use other packages that are specifically written for Ruby. We use Ruby in our setup because our front enders are using a front end tool called Compass which is an extension for the CSS preprocessor Sass. So we need to download and install the Ruby installer from rubyinstaller.org. As before with all installs, we need to ensure that Ruby gets installed correctly and we need to make sure it gets installed into our PATH. Once installed let’s verify it installed correctly by typing ruby -v and also gem -v to test it out. As with NodeJS, Ruby has it’s own package manager and it’s called gem. So we can download packages such as compass from gem. The final thing to install for our front end tools is Compass, which is a tool for the CSS preprocessor Sass, which helps give Sass some extra power with some helpers and extensions. To install Compass we need to run the following commands in the console. For Compass to be installed we need to ensure Sass is installed first, hence the order above for the commands is important. Ok we have everything all setup and ready for the front end workflow that our front-enders are using, the last thing to setup is the TeamCity plugin to use NodeJS and Grunt in the build steps. To install the plugin you need to stop the build runner and the main web interface services on the build server. Once they are stopped you need to copy the downloaded zip file to TeamCityDataDirectory/plugins, note you do not need to unzip the file, simply copy it to the plugins folder. Once the plugin has been copied restart the two services for TeamCity backup on the build server. If you were like me and were unsure where the TeamCityDataDirectory is, then before you stop the services, go to the Administration settings page in TeamCity to point you to the folder location path. Now that you have the plugin installed and have restarted TeamCity, go to Settings followed by Plugin List which should show the NodeJS plugin in the list if it’s installed correctly. Each call/command line is its own step, so we can easily see where the build fails to help us debug the problem. Each step we add here outputs information allowing us to keep an eye at all times what is going on with our build. So when the build is running on TeamCity we can see the build log and the output of each of these steps to give us an insight into what is happening and if any errors are occurring. The order of these build steps is important so that they run in the specific order as defined above. This is to ensure if one step fails it stops and the other steps cannot continue to run. There were a few gotcha’s that caught me out which I’d like to share with you which may also catch you out on your journey to front end workflow nirvana. Bower uses Git to go off and consume packages from Git repositories nine times out of ten it would work fine, however there may be one dependency it was trying to download where it would fail with a weird error message of ‘ECMDERR Failed to execute‘. After some Googling I found the solution was best to change how Git was fetching contents of a repo. So in the console window run the following command to ensure it uses https:// protocol as opposed to git:// urls and this error went away. The second gotcha happened when I received some strange errors back from NPM. It took a while for me to figure out why I was experiencing these errors. However the solution for us was to run the Teamcity service on the server under the Administrator user specifically. After doing so the errors went away and we managed to get the Grunt workflow all sorted out for our frontenders. Hopefully this has been useful to you and now you too can get up and running with integrating Grunt and the world of NodeJS into your TeamCity Continuous Build processes. As it’s the last day of 2013 I would like to look back and reflect on the year that has been. It has been a great & fantastic year after a personal rocky year back in 2012, but as this year has progressed I have gained my confidence in myself back.